In General, Forms are used to provide user interaction on websites and in web applications.The interaction maybe an account creation, Sign in to the account, Commenting,Purchasing,Contacting and more.In the above mentioned interactions Contact Forms are very important because whenever users on the web needs guidance (or) solution they finally lands to contact form only. So if you have a website then contact forms is a must one.And we know that 32% of the websites in the world using wordpress. Because wordpress websites helps to create websites and blog without coding knowledge. In that one important thing is setting a contact form.Because every wordpress user need a contact form which is simple to create. And next thing is rich functionalities in the contact form. Here we are discussing two form builders WPForms and Gravity Forms. WPForms is a WordPress Contact Form Plugin (Lite version) which have 2+ million happy users as of now and it has 4.9 star as average rating .WPForms is 100% mobile responsive. So you don’t need to focus more on device responsiveness. Gravity Forms is one of the leading forms creation plugin for WordPress.Gravity Forms are created by RocketGenius Company .Gravity Forms instead of free version in Wordpress Plugin Directory they have demo and it need some details of you to use it. While using forms, if a user face a problem then this department is the most wanted.So do well research how the support was made in the past by the online form providers. I personally think the above 6 things is not only for contact forms but also for other wordpress plugins.So only i am sharing here once again. The screenshot image is took at , while writing this content.It is a Lite Version .We can call it as a free version.And the screenshot image tells that the plugin was up to date according to the latest wordpress releases. Next let we see Gravity Forms.As already said they have demo option . Just give your name , email and fill correctly captcha to get demo account.You can use it for 7 days And from below image they also updating their plugin according to the wordpress latest releases. So we can understand both the form builder plugins are good in Plugin Compatibility. 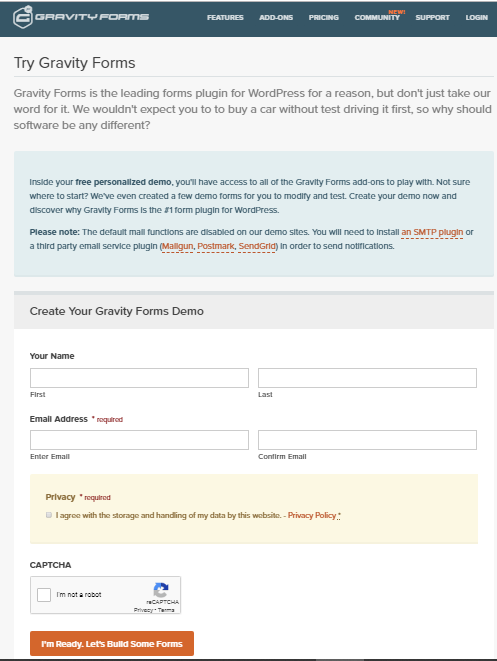 WPForms has Free Lite Version Wordpress Plugin and Gravity Forms has a demo account for 7 days. Now from the above details you can easily guess which is best. WPForms has the smart and best drag and drop builder.You can just drag the required fields to add it to the form or just make a click. Additional to this you can change the order of field just by dragging. Gravity Forms also has cool drag and drop builder.You can drag (or) just make a click to add fields in the form. Conversational Forms-A Super Cool Feature: WPForms recently released and it is the first true interactive form layout built exclusively for WordPress. Conversational forms are available as Add-on in the WPForms Pro and Elite paid version. Conditional Logics – An Another Smart Feature.It is one of the smart feature in WPForms.Consider the following needs (just an sample) in a form..A drop down has 2 options Student and Class .If the user choose Student next it will automatically display to enter first name field and last name field.Suppose if the user choose Class next it will automatically display to enter Class name & it’s section. These things can be done using conditional logics. Whatever you are doing in WPForms it can be viewed within Wordpress Dashboard.For example form entries can be viewed within wordpress dashboard. WPForms can easily findout spam submissions.WPForms uses the honeypot and smart captcha technology. reCAPTCHA can also be used. Here also conditional logics available. Advanced Calaculations available in gravity forms. 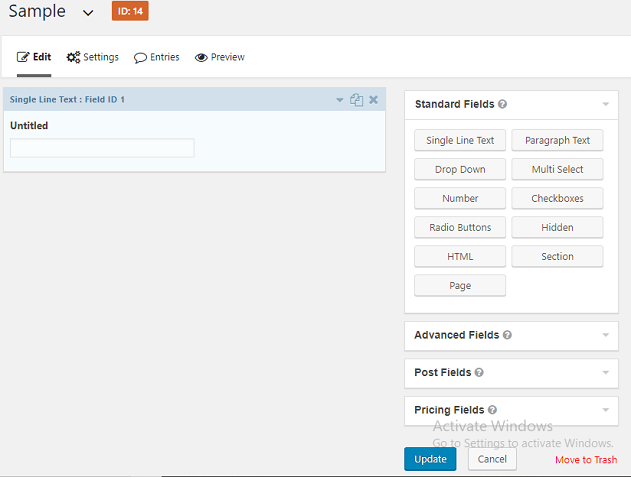 WordPress Post Creation using Gravity front end forms. WPForms has two support options. Basic question:You can use this option for pre-sales question or general question about WPForms site / service works. Technical question:WPforms customers can use this option to get quick reply which is a ticketing system. 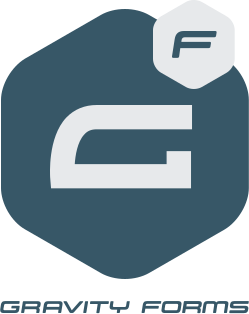 Support will be given only to verified customers with an active Gravity Forms license. Official support hours are from Monday to Friday, 9 AM to 6 PM US Eastern Time.